To establish an Ethernet connection, you need a network interface card (NIC), a network cable (usually a CAT5 cable), and a network to connect to. Different networks are configured to use different network speeds; make sure your NIC is compatible with the network to which you want to connect. Select Ethernet connection from the Device Type list, and click Forward. If you have already added the network interface card to the hardware list, select it from the Ethernet card list. Otherwise, select Other Ethernet Card to add the hardware device. The installation program detects supported Ethernet devices and prompts you to configure them. If you configured any Ethernet devices during the installation, they are displayed in the hardware list on the Hardware tab. If you selected Other Ethernet Card, the Select Ethernet Adapter window appears. Select the manufacturer and model of the Ethernet card. Select the device name. If this is the system's first Ethernet card, select eth0 as the device name; if this is the second Ethernet card, select eth1 (and so on). The Network Administration Tool also allows you to configure the resources for the NIC. Click Forward to continue. 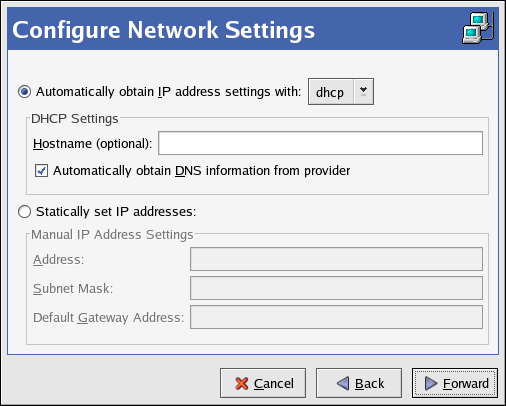 In the Configure Network Settings window shown in Figure 14.2, “Ethernet Settings”, choose between DHCP and a static IP address. If the device receives a different IP address each time the network is started, do not specify a hostname. Click Forward to continue. Click Apply on the Create Ethernet Device page. After configuring the Ethernet device, it appears in the device list as shown in Figure 14.3, “Ethernet Device”. After adding the Ethernet device, you can edit its configuration by selecting the device from the device list and clicking Edit. For example, when the device is added, it is configured to start at boot time by default. To change this setting, select to edit the device, modify the Activate device when computer starts value, and save the changes. 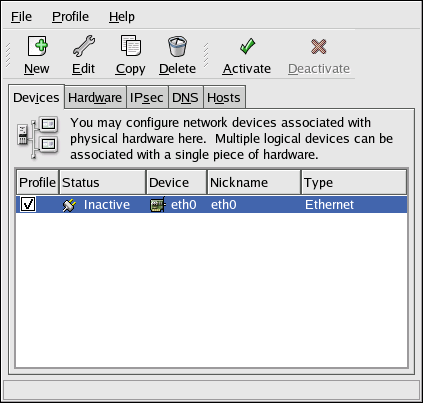 If you associate more than one device with an Ethernet card, the subsequent devices are device aliases. A device alias allows you to setup multiple virtual devices for one physical device, thus giving the one physical device more than one IP address. For example, you can configure an eth1 device and an eth1:1 device. For details, refer to Section 14.11, “Device Aliases”.